Last week was such a hectic week searching for an apartment in L.A., I wasn’t able to do my usual business of researching restaurants, plotting dinners and constructing photo essays for you, my hungry readers. (Exception: Loteria & Gjelina.) We did, however, enjoy many random bites that I photographed, dutifully, in the hopes of writing a post like this one you’re about to read. So buckle your seatbelts! 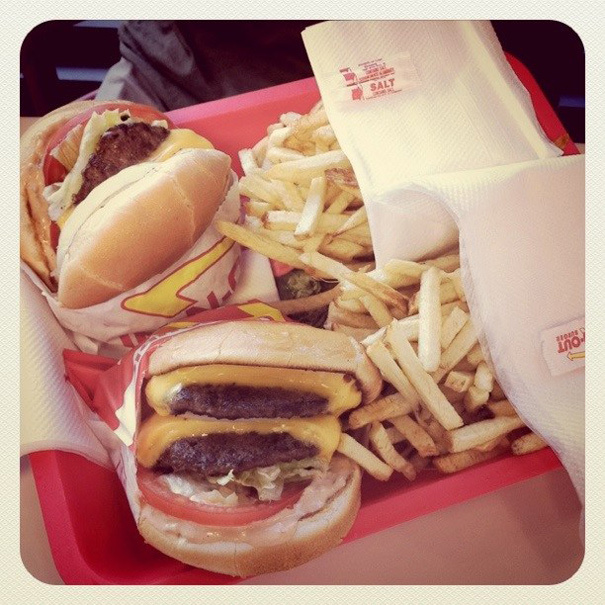 At the top of this post you’ll see an Instagram picture of our dinner at “In-N-Out” burger. 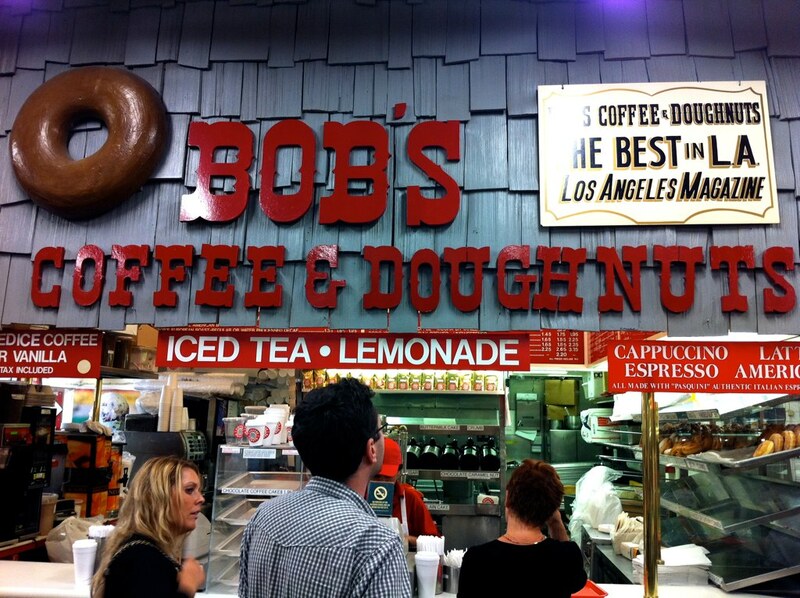 We went to one in Culver City before seeing “Crazy Stupid Love” (which Craig enjoyed and I didn’t, Ryan Gosling notwithstanding). Now I know the thing to do at In-N-Out burger is to order off the “secret menu.” I’m sure one day I’ll do that and order my burger “animal style” (not even sure what that means, though I know you’ll tell me in the comments!) We just ordered simple cheeseburgers (Craig got a double) and fries to evaluate In-N-Out on its official, above-the-board items. Needless to say, they were tasty. Were they better than Shake Shack in New York? Based on this one experience, the answer is probably: no. The meat didn’t taste as pure to me; it almost had something cafeteria-like about it. I did enjoy it, though, on the bun with all of the condiments (including their secret sauce). And the fries, I’m sad to say, were a little bit limp; not as crisp as I would’ve liked. But one so-so experience does not a formal opinion make. I’ll be going back to In-N-Out again and again, so don’t you worry, In-N-Out loyalists. 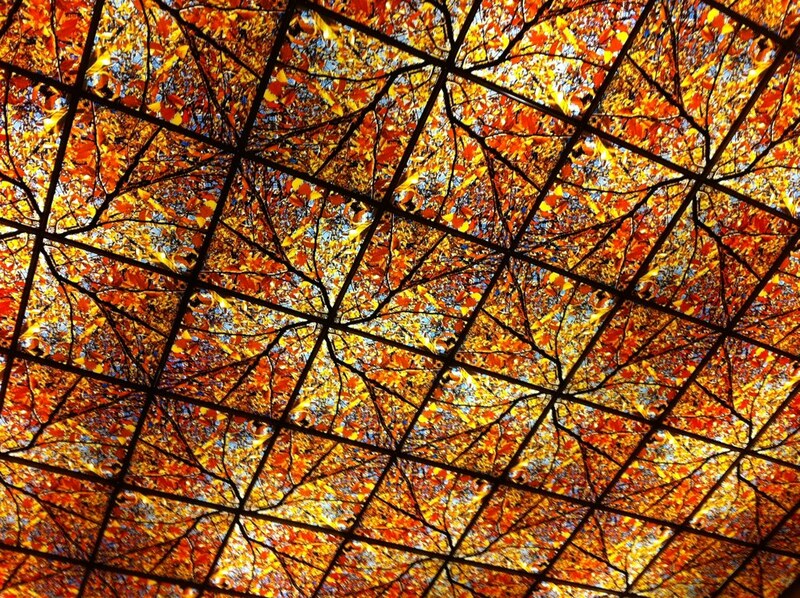 I’m sure I’ll be wowed my next time around. What can I say? 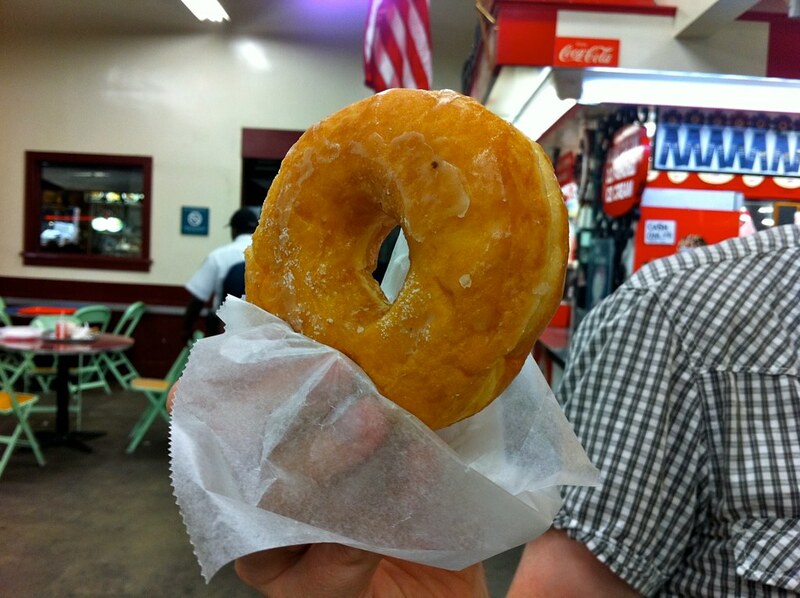 As far as doughnuts go, this was a good one! Though I wonder how much better it would’ve tasted HOT. 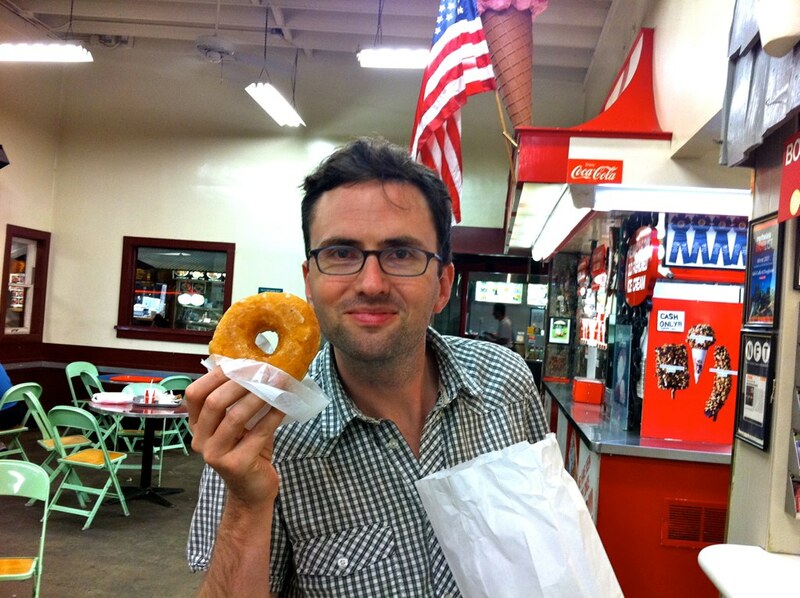 One of my favorite random bites of the trip happened at a coffee shop called Commissary. It was recommended to me by coffee guru Oliver Strand over Twitter. I went there to plop myself down with my laptop on my quest to find an apartment. 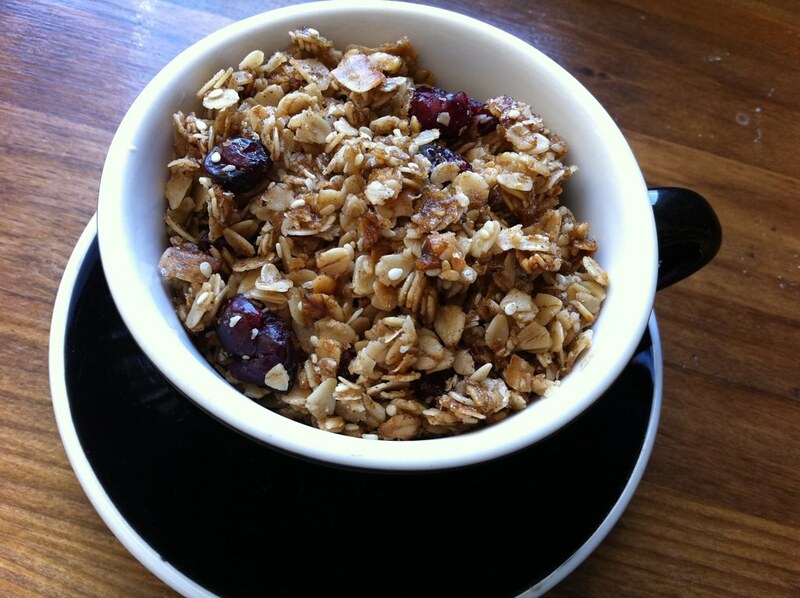 This was a good bowl of granola. 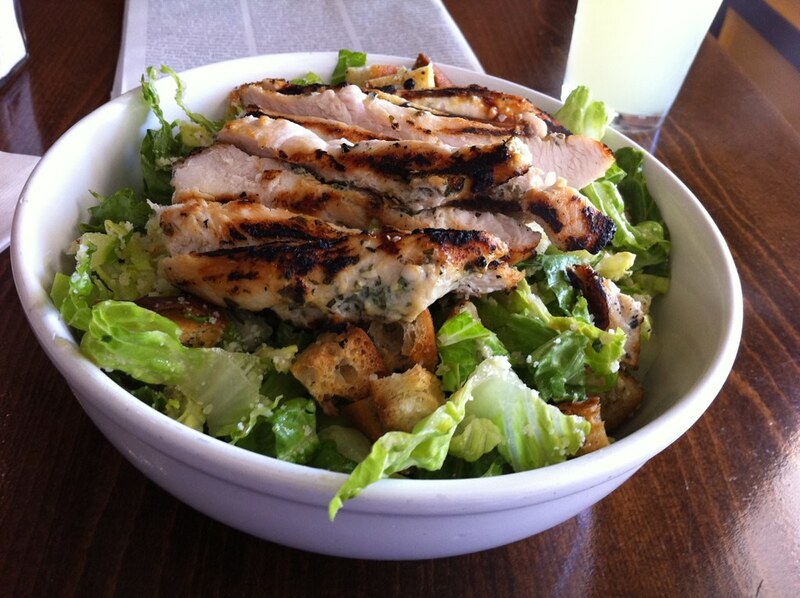 A really good bowl. The extra virgin olive oil flavor doesn’t really come through, but the whole thing has a richness and complexity that’s unusual for granola. And the yogurt was top-notch too. 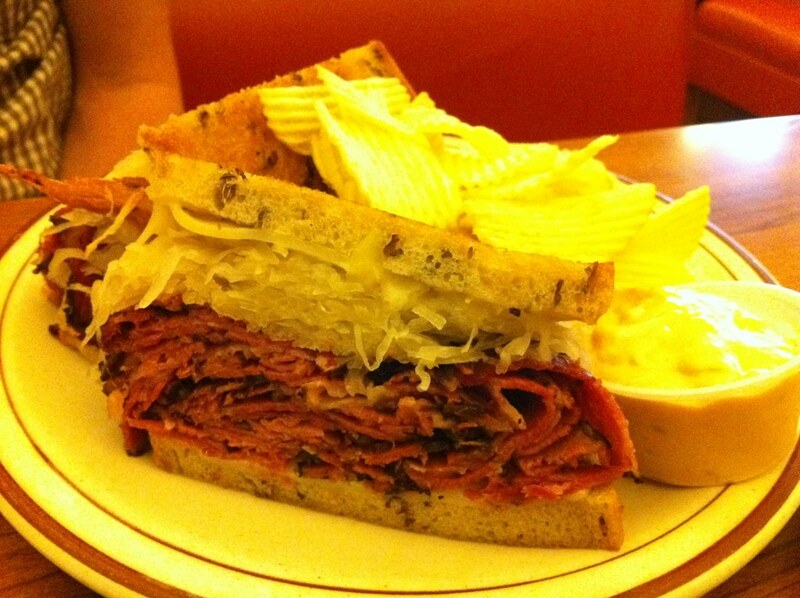 I’ll be eating this again when I get back to L.A. on September 1st. One day for lunch, I was looking for a place to grab something quick on Fairfax (before seeing a horrendous apartment posted by a disingenuous slumlord). I appealed to my friends on Twitter and Zach Brooks, of Midtown Lunch, came through. He suggested Golden State for the burger. 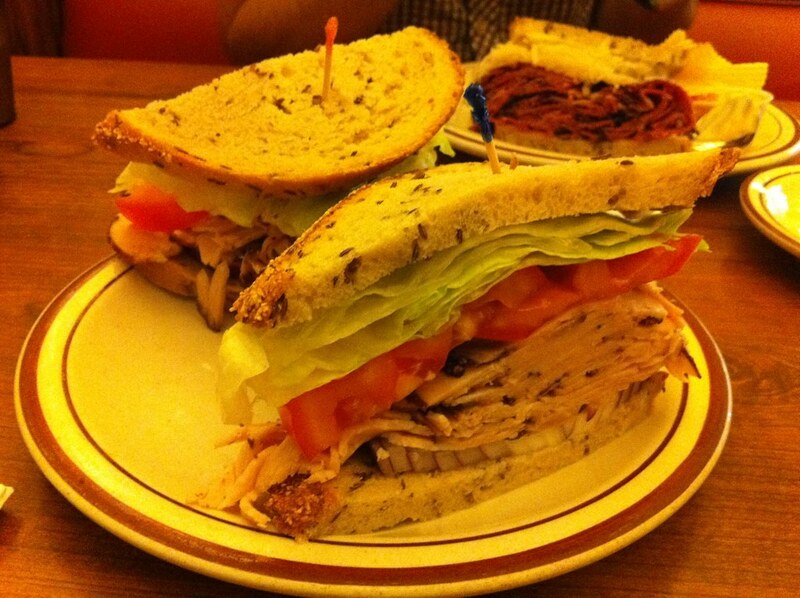 Finally, how could a Jew spend so much time on Fairfax without visiting Canter’s deli? To miss it would be a shanda! 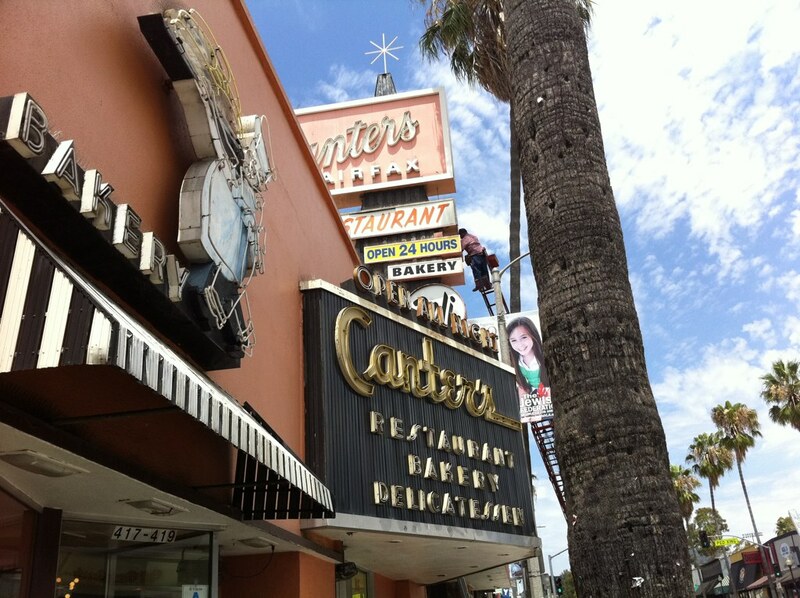 I actually once went to Canter’s, many years ago, with my Nana (who you saw here on The Gong Show) and my Uncle Jerry. The place hasn’t changed since and that’s what’s so great about it. That looks like it’s been there forever too. 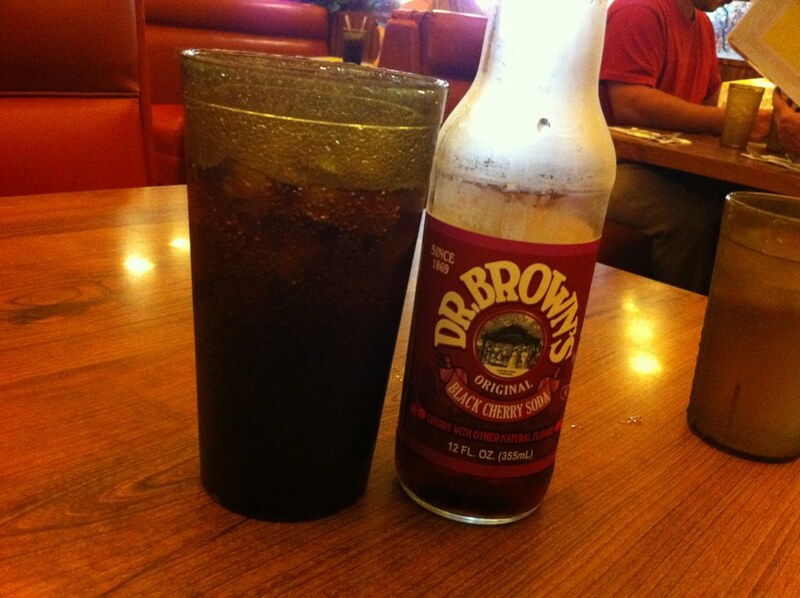 I ordered my usual Jewish deli drink: Dr. Brown’s Black Cherry Soda. All in all, I ate very well in my stressful week of hunting for apartments in L.A. And when I get back there in a few weeks, I have my freshly purchased copy of Jonathan Gold’s “Counter Intelligence” to guide me to some of L.A.’s more storied dining institutions (Phillipe’s for the French Dip, Langer’s for the pastrami, etc). Maybe you can chime in here, too. 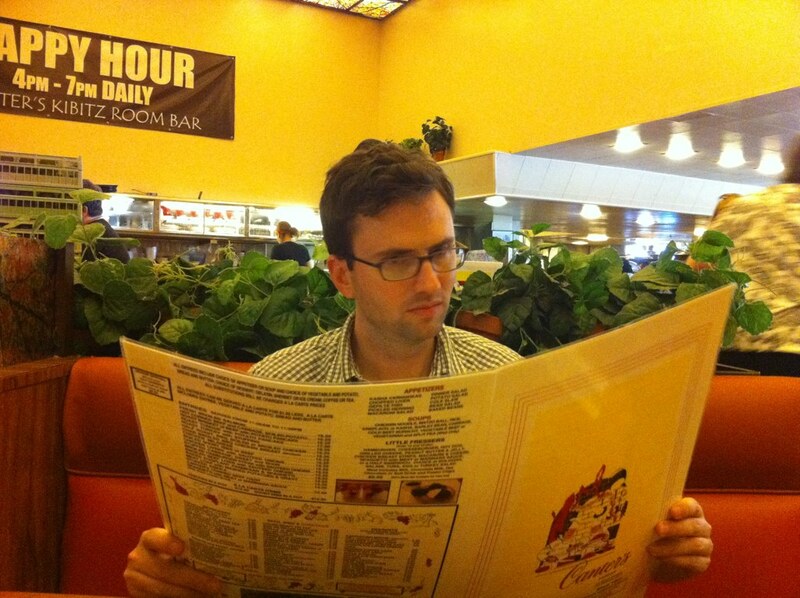 Where should I eat when I move to L.A.? Thanks for all your help!